A patio adds to the beauty of your home. However, it can be an expensive addition, and it is certainly not a simple task to construct one. Make sure to get a lot of help from friends and relatives when you begin construction. This will speed up the process and make it more fun as well. If it comes out right, your patio can turn out to be one of those home improvements that were truly well worth the effort. Gathering Information and Studying the House Surroundings – Taking a look at the house and its surroundings will help you decide what kind of a patio best suits your requirements. Determine the size of the patio and the materials you wish to use. It is recommended that the patio be constructed with materials relatively similar to that of the house so that it matches or compliments the look of the entire space. You can choose from many different options to suit your taste, budget, and time constraints. Selecting Materials – You should be careful when selecting the construction materials, as the patio will be exposed to the climate all year round. Materials should be chosen to suit the seasonal weather of your location. For example, a concrete patio will reflect heat, so it is not advisable to have a concrete patio in hot climates. 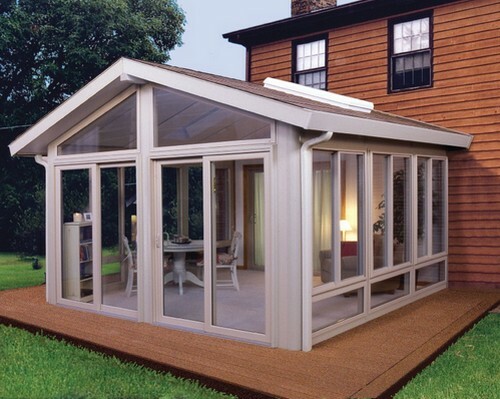 Importance of Using a Frame – Using a frame prior to building a patio is a good idea, as it helps you to visualize the design and eases the construction process. Build a wooden frame around the area to mark the territory and give the space some dimension. Then, using the chosen material, line the patio space according to the chosen design and give it finishing touches. Digging – You can begin work on the construction of the patio with materials such as bricks, stones, pavers or concrete. To start off, dig the space at least 10″ deep and level it with stones, gravel, and sand. Make sure that the patio slopes away from the house. The measure of the slope to the leveled land should be .25″ for every 12′. This will help keep excess water away. Construction – Pour gravel to a 1 inch dept. Scrape it to level the material so it slopes correctly. Add sand on top of it and level it well. The sand should follow the same slope. Add pavers in the preferred pattern. Keep them in a straight line. Stabilize it by tossing some sand over them. Wet it down. Choosing the Right Décor for Your Patio – Once you finish constructing and landscaping the area around your patio, you should focus on the décor. Choose patio furniture and décor that matches your personality and lifestyle. However, don’t forget that the climate of the place you live in must also play an important role in your choice. Make sure the furniture can deal with the climatic conditions. For example, if you plan on keeping your furniture outside all the time, make sure it is resistant to rain and harsh sun. Design the patio to complement your current living space. 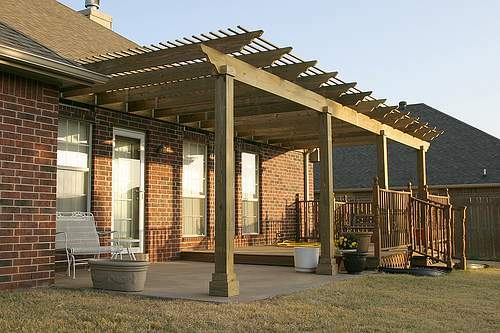 The lumber used for frames and shade should be waterproofed and of good quality to ensure your patio lasts for a long time.